► please view my Dark Force Hud v2 that now includes the same power! Legend has it these weapons were forged from pieces of Zeus' Lightning Bolt. 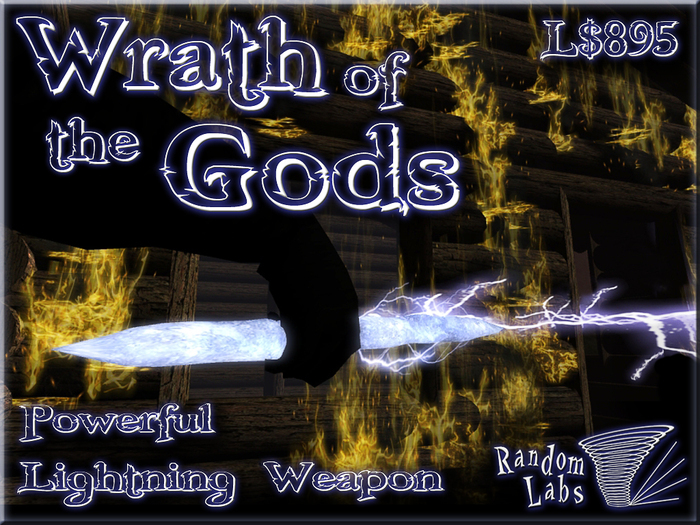 The power of the Gods can now be wielded by mere mortals, but be warned... with great power comes great responsibility! This device is very easy to use, simply right click it in your inventory and select "Wear". The device should appear in your right hand. In the folder you should see a selection of gestures called "Lightning Switch (F1 - F12)". These gestures will arm and disarm the weapon using the F keys. You only need to activate one of them for which ever F key you would like to use, then clicking that F key will toggle the weapon between armed and disarmed. To activate one of the gestures, right click it in your inventory and select "Activate". You can also click the device to arm and disarm it. Lightning Strikes - For lightning strikes, aim at an object or avatar (up to 100 meters away) and single left click your mouse. A moment later lightning will strike! When the stream hits a non-physical surface, it will scorch it and you will see scorch marks and smoke. If you aim the stream at one place for a few moments it will catch fire. To keep the fire going, move the stream slowly... too fast and it will only scorch it. When the stream hits a physical object, avatar or vehicle, it should send it flying. For the best results against avatars, aim for the head! This will usually send them flying across the sim in free-fall (meaning their arms and legs flail like when falling and they land flat on their face!). Lightning strikes fire downwards and are most effective against objects and vehicles. At ground level it won't have much effect on avatars unless in a damage enabled area. If the avatar is on a platform, stikes will usually push the avatar through the platform and send them falling towards the ground. * The lightning stream has a 50 meter range, strikes have a 100 meter range. If you're aiming well but nothing happens, get closer! - The weapon relies on llCastRay to work, if the region is overloaded it might fail, in which case you will be informed of the reason. - Weapon is not effective against avatars that are flying, sitting, or shielded. - The scorch marks and fire prims are temp (meaning they will last around 2 minutes before deleting) and totally unscripted to keep down the lag. - Your arm will animate when firing to match your up / down firing angle. This weapon is primarily designed for RP magic and generally looking awesome in front of your friends. Please always follow the SL TOS when using this weapon, I hold no responsibility should you get into trouble for doing things you knew full well you should not have been doing! I also reserve the right to disable your weapon should SL TOS be flagrantly ignored, and to disable its use temporarily or permanently in certain regions should the need arise.